Don Jeronimo de Carranza founded the system and school of Spanish rapier known as La Verdadera Destreza, in the late 16th century. Unlike other schools that existed during that time there were no guard positions. Rather the Spanish school utilized one single stance/posture. The swordsman assumes an upright, semi-profiled posture with the heels slightly apart. The arm is extended straight forward at shoulder level holding the sword with its blade parallel to the ground menacing the adversary. All combat takes place within an imaginary circle on the ground. The footwork is circular, angular and linear. Although utilizing a solid foundation on essentially simple technical manipulation of the sword, the approach is more conceptual and theoretical than other schools. The two types of weapons used and taught are the swept-hilt rapier of the late 16th and early 17th century (what we designate today as a “side sword”) and the cup-hilt rapier of the 17th century. The system of Spanish rapier taught is based on the teachings of Don Jeronimo de Carranza (1569), Don Luis Pacheco de Narvaez (1600), Don Francisco Antonio De Ettenhard (1675,1697) and Don Francisco Lorenz de Rada (1705). 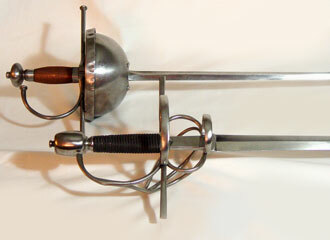 Instruction in Spanish rapier includes single rapier, rapier & dagger, and rapier & cloak.